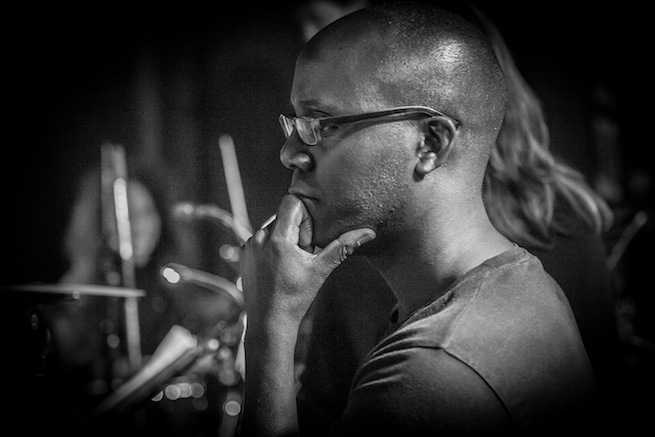 Robert Mitchell is more than just a jazz pianist, composer, band leader; he is an exceptionally deep, thoughtful, conscious and laterally thinking individual who, like an artist or painter takes a few steps back in order to get a wider perspective of what he’s creating. He is continually making minor adjustments to himself and his music like a sailor tacking every so often to keep his boat on track. 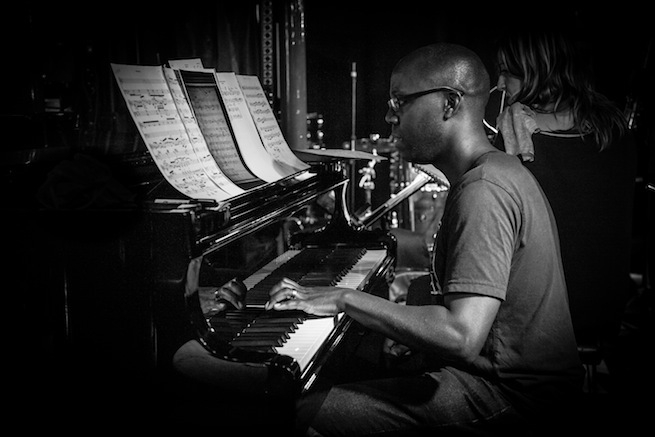 It’s this attention to detail and pursuit of excellence that has made Robert Mitchell, one of the most highly revered and in-demand Jazz/Classical pianists/musicians of the present-day, both in his native UK and globally. 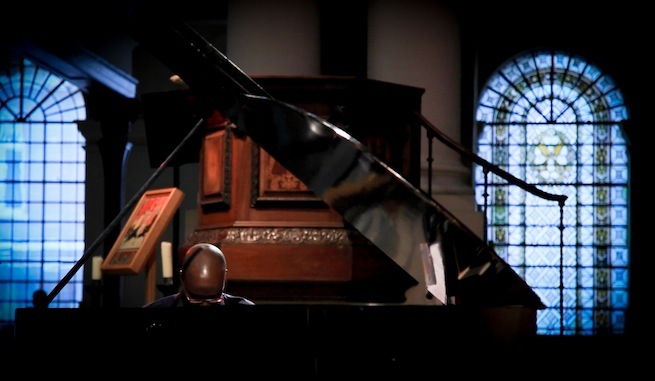 Michael ‘The Dood’ Edwards caught up with Mr Mitchell, who was having some well-deserved downtime a week after having performed ‘Invocation’ – one of his most challenging works to date at St Peter’s Church, Bournemouth. It was a mouth-watering taster of what one can expect on November 23rd, when he performs the identical work with a much bigger ensemble in Queen Elizabeth Hall as part of the 2014 London Jazz Festival later this year. The Dood: Mr Robert Mitchell, it’s great to talk at last. No doubt you are still buzzing from the ensuing positive feedback received from the first outing of your extremely personal and experimental project ‘Invocation’ recently in St Peter’s Church Bournemouth? Was the live performance all you envisioned in your minds-eye? Robert Mitchell: Well we had a wonderful performance, yes. At the same time there is more to come! Originally Invocation was on a different path, so it really did grow and grow over time. We’ve been very lucky to get to this stage. There are many musicians in general, who would obviously love to do something on that scale whether it’s choral or orchestral etc. But to get to do it is another thing altogether, as there’s so many people that all need to be working well together as a team to make it happen. So it’s an extraordinary process to originally go from writing the music humbly for my band and then expanding it over time to this point. And more to come means having the grand addition of the Goldsmith’s Big String ensemble and the fantastic Eugene Skeef in the upcoming London Jazz Fest. The Dood: I understand your long-term good friend and lead vocalist Deborah Jordan played an integral part in bringing the Bournemouth Symphony Choir onboard through passing on some of your recorded music. Please enlighten us further? Robert Mitchell: She’d been a member, firstly when she was in her teens and then stopped. We met when we were students at City University and the Guildhall. She rejoined when she relocated a few years ago. And yes she’d then given the Chorus Master, Gavin Carr a copy of our last Panacea CD, which was called ‘The Cusp’. Actually, it also featured a few string players, so there is a connection to the whole Goldsmith’s thing, which I’ll come on to in a minute. Gavin really enjoyed the CD and after that we managed to do a residency at Southampton University, which was a set of rehearsals; seven or eight rehearsals I think, plus a performance at Turner Sims Concert Hall in Southampton, which is part of the University. And that residency involved Panacea and fifteen student singers, so the music was partly developing during this time. In planning the residency – I was alerted to the fact that Southampton had a number of vocal students, whether they were first or second study. So in terms of doing a project with them, I though that would be the best way to integrate them smoothly rather than be tethered to a very very specific ensemble. And of course we’ve got this whole era of heightened choral interests, partly due in a big way to the BBC TV series “The Choir.” So just with all these sensibilities around I was influenced to go in that direction. For that culminating gig, Deb had invited the secretary of the Bournemouth Symphony Chorus (BSC). She came down and really enjoyed it, and that was the first firm link made to the BSC. Months later she gave us the thumbs up to go ahead and work together – being very busy and having been honoured by the Queen during the interim! The Dood: For the record, what was her name? The Dood: How was the lead-up to the concert, preparation-wise? Did everything run smoothly? Robert Mitchell: Well, yes, it’s just that there’s a lot of work, acclimatisation and listening, because I had worked very intermittently with choirs before. Funnily enough I had done a thing with the singer Ola (Onabule) earlier this year and a great choir from Estonia. These young girls are just phenomenal! And that was about thirty of us. Coincidentally, that was at the Queen Elizabeth Hall, London – where we are going to be performing in a month’s time. Before that it would have been ‘Soul Noel’ five odd years ago, which was with a smaller bunch of voices, but equally phenomenal people like Ken Burton and Mary Pierce. This was a Serious production, being arrangements of Christmas carols in a Soul and Jazz context. So that was a really good experience as well. In the preparation of Invocation – there was becoming part of a large sound to get used to and a new quality of interaction to establish. I think the Bournemouth Symphony Chorus are meticulous in their organisation, their routine, and the way that they work with the Chorus Master and the Secretary is an honour to witness. It has made it seem as if we are working with twenty people as opposed to one hundred and thirty! We’ve had years together as a group (in Panacea). This all goes into our present day style of learning. We’ve had a number of months with the Bournemouth Symphony Chorus, involving a lot of listening and developing clear cueing – at the service of the fluidity in form that we’re more used to as improvisers. And as a band we are more aware of the things we need to make overt in rhythmic terms in particular in this large version of Invocation. Because we both have times where there is a stricter need for adherence to a groove or rhythm. Or where we can give prominence to a more romantic classical sense of rubato and a flow that’s guided by phrasing and the conductor’s sensibilities. I really enjoyed writing to encompass all of that. We’ve also had twenty fantastic students from two Colleges in Bournemouth – Avonbourne and Harewood. We visited them a number of times and they were outstanding in that they’d learnt the material, were disciplined and very well led by their teacher – Sam Priest. They’ve worked with Deborah Jordan before, who chose them specifically for the project. A great choice! The Dood: I know this particular project is very dear to you. Why the title ‘Invocation’ and please describe your thought process leading to its conception? Robert Mitchell: It is a reference to the effect an inspirational teacher will have on somebody. I know the word obviously has a very spiritual and religious background. So it is for me a reference in more spiritual terms to what a fantastic teacher can help the student bring into being. I suppose the old Greek definitions really dominate when you talk about the Muses. Lots of other cultures have had their own versions of this, but it references the significant spirits that guide and inspire and support from afar. As you look for answers to some of the biggest questions for anyone such as, “What is the thing that really inspires and grabs you, what would you want to do as a career etc’ – these teachers can without doubt really help. So if you’re in a lucky position to meet someone and be guided by someone in your youth, who’s that supportive, it is an enormous advantage. Even if it is in music, you still need the right person at the right time to help for particular things, because with any art there is a vast number of things you can do (as within any field). It could also be the teacher who is an inspirational figure but not in a field that you want to pursue. However, the way that they behaved and the way that they were relating to their own love of the subject can be an inspiration in itself. So with a great many questions surrounding tolerance, difference and the need to truly address the things you love – if people are not able to do that for themselves, or are not exposed to good opportunities to meet that magical teacher, this is where you get the sort of involvement in gangs and the huge waste of potential that is tragic. Invocation is a tribute to my most inspirational teachers, so I would love listeners to think about their own personal favourites, or at least derive a space to be regularly grateful for them. Added to that is the fact that we don’t celebrate teachers nearly enough. I have written some programme notes that refer to ‘World Teachers Day’ which is on the 5th October. And there are some fantastic and varied traditions from around the world that celebrate teachers on that day. If you walked along the street and asked someone about that date in the UK, how many would even know?! What do we do about this in the UK? The Dood: Are there any Chamber performances that have inspired you towards writing invocation? Do names like Tord Gustavsen, Jaccques Lossier, Billy Childs or Philip AaBerg resonate with you? Robert Mitchell: Out of those in particular, Billy Childs and the two chamber jazz albums he has done. I think at least one of them won a deserved Grammy. But yes, that is an influence in terms of the integration of those elements. Chamber and Jazz, there’s no better sort of description, as these recordings organically encompass Classical elements and American and European Jazz sensibilities. Billy had worked with those players in his extended ensemble for years before recording the albums. Which was great to read, because it sounds seamless. Nothing sounds compromised. Which can be a problem, especially if time is short. You need time to absorb these approaches – doubly so if it’s an ambitious ensemble. So we’ve been really blessed with the BSC and to have that time within their rehearsal schedule. They have a packed timetable. Their new season has just started, involving some of the biggest works of Verdi and Bach, as well as commitments to appear with the Bournemouth Symphony Orchestra (who are also world-renowned). The Dood: November 23rd, sees you bringing a much more embellished, personnel-wise, presentation of ‘Invocation’ to London’s Southbank at Queen Elizabeth Hall as a grandiose finale to the 2014 London Jazz Festival. Who are the extra additions for the London performance? Robert Mitchell: I’ll go with Eugene Skeef first. He’s someone I’ve known since my involvement with the first band I was in as a member, which would be ‘Quite Sane’ in the early nineties. An important link was also the visionary musician Bheki Mseleku. They were great friends and they were a great support to the band. And of course you’re dealing with a generation of South African musician who had been forced to flee from South Africa at the tail end of that notorious period of apartheid. He’s a master teacher; he is truly one of these worthy examples. I had a great experience finally getting to work with him in that context at a place called Aldeburgh last year, which is the legendary complex set up by Benjamin Britten for concerts, teaching, residencies and also visual artistry as well. He is also a great percussionist as well as working in conflict resolution too. I had him as a guest on my second album, ‘Trust’ (which is also a ‘Panacea’ album). That was nearly ten years ago already unbelievably, and his feature was a piece which was a tribute to Bheki as well. Eugene is a legend in several areas that link the music and cultures in South Africa and the UK. The Dood: So he’s got previous as they say? Robert Mitchell: Oh, very much so! And then he’s done some great work with various orchestras and is involved in the ‘Big Big Sing’ initiative, which had a tune of his sung at the Commonwealth Games. It is a blessing that he’s around and able to take part in Invocation in London. He will be playing and also narrating because in between each of the movements there are a few quotes from various inspirational figures, who have been our great teachers e.g. Gandhi and Martin Luther King etc. The internet actually is limited in size with regards to Eugene, as his story is epic! The only other addition is the unique Goldsmith’s Big String. It’s a mix of student and professional string players. It is run in Goldsmith’s College/University of London and was founded by Julian Ferraretto, who’s a fantastic violinist and arranger. And he was on ‘The Cusp’ album, so I’d worked with him before. It’s a very young ensemble, but they’ve already worked with the great guitarist Antonio Forcione and pianist Neil Cowley and it’s been fantastically received. It’s a project about strings grooving in a big band sense and having that become a bigger part of string education. A brilliant idea. I very much enjoy writing for strings, especially since the days of my dreaming about doing so – via any synth with a string sound! .’The Cusp’ album featured the equivalent of a string quartet. So Invocation is a big leap in numbers once again. The new players are signing on as I speak, so I’m not sure what the final total will be, but they’ve averaged twenty-five to thirty players for their past projects. It is a more orchestral version of things that i cannot wait to hear! So GBS and Eugene Skeef are the big additions for this special gig. It is a debut appearance for Panacea at the QEH. I think it’s the first time for GBS and it certainly is the first time Bournemouth Symphony Chorus and the students would have played there. But given the standard of those students and what they were able to do at Bournemouth, they should be appearing in a hall like that more often. Without doubt – It is a big debut for me too! The Dood: Wonderful Robert. I, like many others, am definitely looking forward to that unique performance.